I was wondering if anyone has done it here to a 510? I think you can also pull the quarter panel outer skin and swap it from a 2dr (as well as swapping or moving the b-pillar), but I suppose those would be pretty hard for you to source. Either way it's a lot of work and a lot of possible ways to screw things up badly. I'd highly suggest getting the car operating as a 4dr and enjoy it, rather than attempt such a big project. I know I'd rather have a drivable dime, than the one sitting as a never ending project that I can't enjoy. 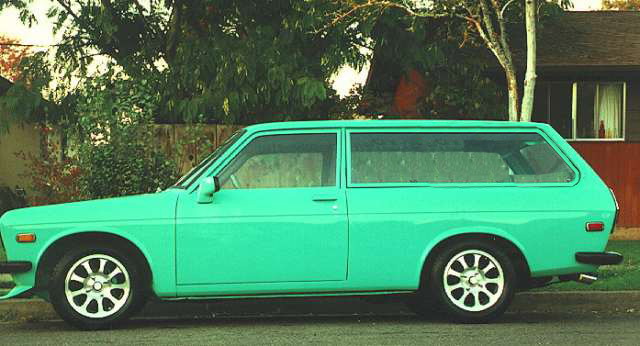 There was a 510 in portland someone made into a 2 door. All he did was weld the back door shut and smooth it out. I used to want a 2-door sedan something fierce, but the more I look at em, the more it seems fitting that the sedan version has 4-doors.. Something about a 2-door sedan just seems.. off.. Not bashing or putting down 2-door sedans; I'd still own one. But I wouldn't trade the functionality and aesthetics a 4-door for one. A Coupe on the other hand.. well, that's a thing of beauty that is unopposed in style and elegance. The slope on the back of a coupe is pretty cool,hate those fender mirrors though.Well micro I feel just the opposite of you as far as the two and four doors are concerned,but I guess thats why they made both. And thats what makes the world go round. I bet we both agree those nissan cubes are fugly? Two ways to go! Yes, it can be done! That would be the reason to go from 4 door to 2 door. it would be better if they did the 2dr swap as well, what the OP was talking of doing. I get it... but you don't! Call me crazy. But I always wanted a three door car. One door on the driver side to look cool. And two on the passenger side. For the kids and wife and stuff... No? Looks at tad photochopped, is it? i told him if its still there after canby 2011, im taking it home! 4 door 510 is better looking/stronger. buy a 2door they comeup for sale. just pay more. 4 door better looking.Someones been smokin the banzai tree. 4 door is better looking. I dont like the big panel of nothingness behind the doors on a 2 door. That of course can be fixed with some nice flares which is near impossible on a 4 door. My favorite thing about the 2 door is that when you pull out of a parking lot and look to the left your vision isn't blocked by the pillar. 2 doors always look better to me,no matter what the make or model.